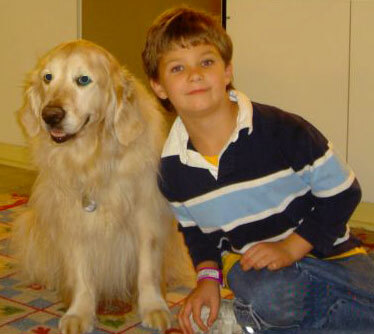 St. Jude Children's Research Hospital Therapy Golden "Kicker"
I have been corresponding with Nancy Quinlan (August thru October 2007), her son having been involved in treatment for leukemia at St. Jude since the young age of four. Her story has a special significance for me, however, given my previous post graduate research with pediatric oncology families at Johns Hopkins University. I am very much hoping that I can be successful in linking her up with a Golden Retriever breeder, so that she can make a special dream come true for her young son. Please contact me if you know of a Golden breeder who may be able to help. I have a seven-year-old son who will complete chemotherapy in October for leukemia at St. Jude Children's Research Hospital in Memphis. He said that when his treatment is over, he wants to "run into the ocean with a dog." We have not been able to let him swim in the ocean for the last three years of chemo. I am looking to surprise him with a Golden because he bonded with a Golden Therapy Dog at St. Jude. Also, we had two Goldens before. If you have any information on a Golden that flunked out of training—that needs the love of a very brave boy—that would be great for us. It would be hard for me to train a puppy at this time (having trained two before!). . . .
Brian's end of chemo party is October 4th at St. Jude. I understand it will take a little while to get his immune system back to normal and take his port out. I'm thinking November, possibly December for his big surprise? As far as cost, realistically we could spend whatever it takes, but $400 would be a relief. We have a lot of medical bills. As far as age of the dog, that is completely flexible. At 15 months, they begin to realize that you're talking to them, if I recall. 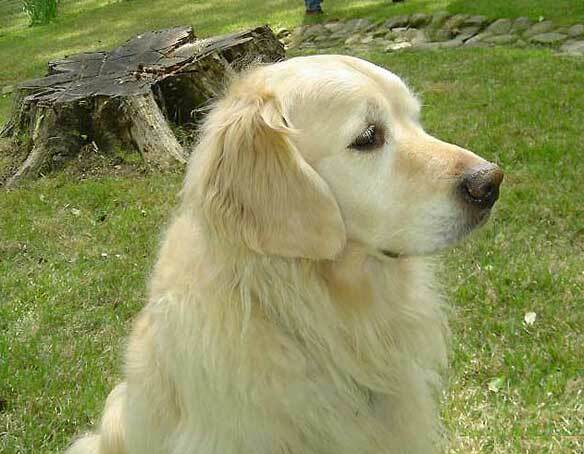 My first Golden was an American type Golden, but our second was an English Golden named Bono. He was a lifeguard dog. I had trained him to jump in the pool, let the "drowning" person grab the extra skin around his neck and he would pull them to the pool steps. He also brought in our morning paper, rain or shine. I miss him very much. Brian was about two-years-old when Bono died at age 13. In a way, it was a blessing because it would have been very hard to have a dog and go back and forth from our home in Florida to St. Jude in Memphis. We also had to keep our house so clean. Thank you for any help you can provide. If it doesn't work out, I am sure we will find the right situation for Brian. We have been very blessed so far. . . .
Brian had his last chemo in Florida yesterday (September 28th). Monday, we go to St. Jude Children's Research Hospital for biopsies, bone density testing, MRI's, and scans. If they find nothing, he will receive his last chemo ever!